Update 21 August 2009: This eatery has been replaced by a noodle shop, a not too good one at that.Sayonara. The last thing I expected to find in the area around Champs Elysee was Umami-An, because well, I wasn't really looking for any food outlets bearing my blog's name and second, the Champs Elysee is better known for more upmarket/trendy/expensive dining options and fast food establishment rather than Umami-An which fits neither category. 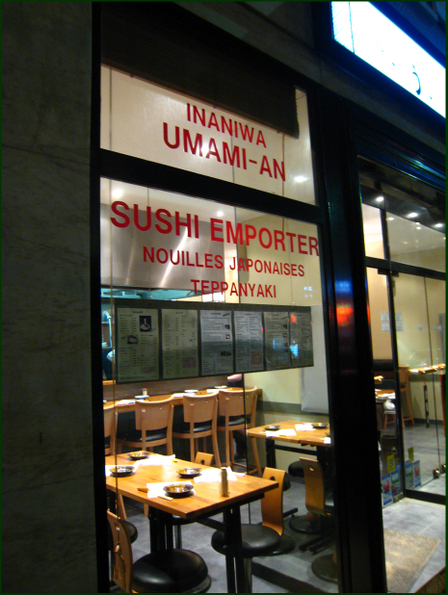 Umami-An is a tiny unpretentious place serving casual izakaya-style dishes in the evenings and sushi in the afternoons. It obviously takes pride also in serving the inaniwa style of udon. Although the menu is small, everything that I have tried on two visits were excellent, authentic and most items are cooked on the spot by the youthful Japanese cooks in the front counter. Prices are also reasonable even for dinner, e.g. a selection of 3 'small bowls' is 7 EUD and the most expensive item is their Steak with Japanese Seasoning at 18 EUD. On my first visit with husband, we tried some of their 'small bowls'. 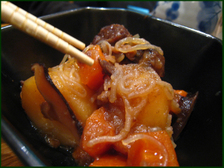 Our favourites were a carrot and daikon salad and nikujaga (simmered meat and potatoes), all go very well with beers and sake and we did like Japanese salarymen and lingered over our snacks and drink, chatting about nothing in particular. Rufus was allowed to sit on the banquette table, he even trotted over to the neighbours table and put on his most obedient charming pose but was not rewarded with any food morsels, and had to slink piteously back to our side. 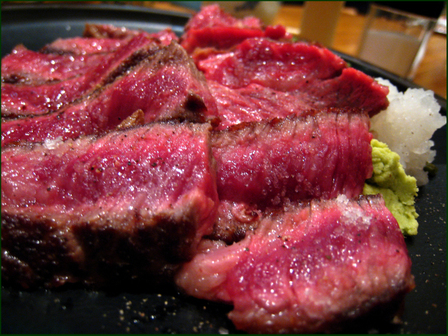 The cooks took their time too, and eventually it was our turn to be presented with the Steak with Japanese Seasoning. 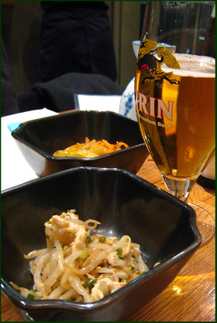 Despite the long name it can only be described as oishi! Two thumbs up, the meat was tender and juicy without needing to be overly fat, the insides exactly medium rare as we requested. We asked for recommendations, the waitress who tooked this question posed it to the chef who unhesitantly recommended okonomiyaki. So we had okonomiyaki, and it was great. 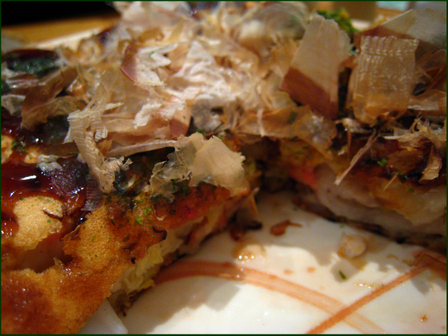 Nothing like the doughy monsters we had the bad fortune to eat in the past, the okonomiyaki has almost crisp exterior encasing loads of crispy cabbage, scallions, seafood and (this probably didn't hurt) pork belly strips, the batter only serving to hold everything together. We could have stopped here but husband wanted more food, so we finished with a plate of fried udon. Cooked on the same large hotplate that also turned out the steak and okonomiyaki, the silky noodles were just as satisfying, nicely tossed with a light sauce and plenty of mushrooms and julienned vegetables. But I preferred the soup option, which I ordered when I lunched here with Sui Mai of Sui Mai-a Wai Sik Guide blog; it allowed one to appreciate the clear light broth and the slightly chewy yet very silky qualities of the fine noodles.